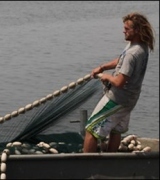 (BBC): The Sea of Galilee has for centuries provided a healthy living for hundreds of fishermen – the disciple Peter among them, according to the Bible. But now an unprecedented fishing ban is being enforced on the Galilee because, says the Israeli government, chronic over-fishing has severely depleted stocks. The Sea of Galilee is a mythical and historical place. It was here, says the Bible, that Jesus walked on water and in the hills overlooking where he fed the 5,000 with two fish and five loaves. According to the Gospels, when Jesus told Peter to cast his nets into deep water, "they caught fish in such large numbers their nets began to break". 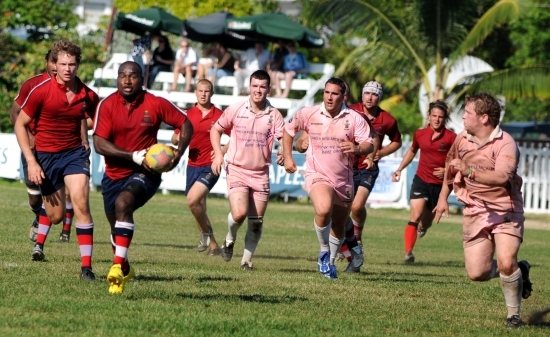 The Cayman RFU were both excited and apprehensive over the prospect of facing a squad which promised to be of high caliber and coming from a nation which prides itself on fast, expansive and hard hitting rugby, especially after having played a full international against Bermuda the previous week. On Friday, 7 May, a mixed bag of players took the field against the Police and quickly found themselves staring down a 17 point deficit after only 40 minutes. From the first whistle the Welsh came out guns blazing and Cayman was caught off guard by such a powerful onslaught of fast running and quick passing, but what quickly became clear to all involved was that the Welsh visitors had not factored in the Cayman heat and humidity. A Cayman 2nd half comeback against a now tired and drained Welsh side, instigated in no small part by the smart kicking of Ed Hayward and the inclusion into the game of the Fijian rugby stars, Venassio Tokatokavanua, Seviri Tabunawira and Raqtoi, started to turn the tide and Cayman came nail bitingly close to a comeback win but were undone in a close battle 21-24. Having sized up the competition and knowing that the South Wales Police had some players hidden up their sleeves Cayman prepared for a huge clash and picked a select squad of some the finest players available on island to take on the competition and earn National Coach Brad Cowdroy his first win in charge of the squad. The game was at all times a fiery affair and the Welsh Police took an early lead thanks to 2 penalties in the opening exchanges, but those 2 penalties were to be the only points earned for the Welsh visitors that day. 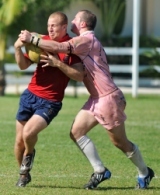 The Cayman defense stood strong and not once did the Welsh team cross the Cayman line for a try. 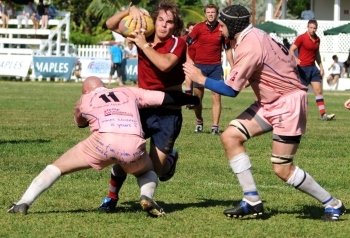 The Cayman select squad meanwhile racked up 39 points in a 39-06 hammering of the opposition. The result was unexpected but the Welsh voodoo against small Island nations, which has been in the forefront of the Welsh Rugby psyche ever since Wales were sent crashing out of the 1995 Rugby World Cup in the pool stages by the island nation of Samoa, continues. Albeit for the result, the camaraderie between the 2 sides was visible as always as shirts and gifts were exchanged over post match beers. The South Wales Police will sadly head back to Bridgend with a 26 year unbeaten touring record in tatters thanks to the Cayman Islands but will no doubt have enjoyed their time on island enjoying all that Cayman has to offer. (CNS): The UK’s new prime minister is expected to name who will be responsible for overseas territories in his new government today, Thursday 20 May. Although former Conservative party leader William Hague has been given the top job at the Foreign Office, political pundits in the UK are speculating that in the Con-Lib coalition a number of the junior posts will be given to Liberal Democrats, a party that has been outspoken about so-called tax havens. It is quite possible that the Cayman Islands Government will be engaging with a liberal democrat in order to secure permission for further borrowing to plug the deficit. No confirmation has yet emerged from London about who the likely overseas territories minister will be, but Tory or Lib-Dem, the CIG is unlikely to face any more favourable position than if Chris Bryant had held on to the job. 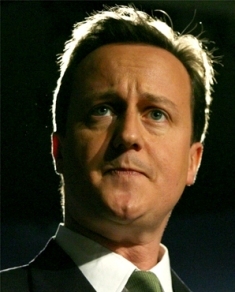 The full team of junior ministers will be announced later on Thursday, Cameron has said. "Everything you can do to welcome them and build strong teams in your department is obviously hugely important," he reportedly told his front bench team. The new foreign secretary has said that he is determined to put in place a "distinctive British foreign policy" and the situation in Afghanistan is a priority. Hague was seen as de facto deputy party leader until that post was given to the Liberal leader Nick Clegg. With his new Cabinet now in place, the new PM has held his first cabinet meeting and according to reports in the UK media he has banned mobile phones and BlackBerries from those meetings. One of the earliest announcements was that ministers will be taking a pay cut. The civil service is the Caymanian middle class. It is the most tangible evidence of how Caymanians have benefitted from the staggering economic development of the past 30 years. The stability of the civil service is the most critical element to maintaining our national success. I hope I am not proven right. During difficult economic times, it is understandable that members of the private sector (and wanna be civil servants) complain that civil servants have secure jobs and steady incomes. They also rightly resist any hint of taxes or raises in fees – after all, governments will usually find ways to spend the funds, and not always in the most prudent fashion. Read the blogs today and these folks are having a whale of a time criticizing civil servants and daring the politicians to slash and burn. They however do not understand that Government is much more than a business. If only it were so simple. We cannot afford a destabilized civil service – the consequences are too grave for all of us. Remember also, the Miller report found that the Cayman Islands had a “low tax burden” and that while the government expenditure on personnel costs in ratio to overall expenditure was high in comparison to many places, they also pointed out that other countries have huge welfare costs that we don’t have. Take the welfare costs in these countries and add it to their civil service costs and you see how favourable we compare. The G8 countries should be aware that the alternative to our economic model which encourages the voluntary inward investment from their nationals, – is that we become yet another third world country with all the myriad of problems which comes along with that. This actually costs the G8 and their citizens more in the long run (with no return), as it requires a never ending series of bailouts, IMF loans, poverty reduction strategies, disaster funding, crime and security issues etc., for the foreseeable future. I don’t know about you, but I would rather pay for a generally effective and reasonably uncorrupt (even if slightly bloated) civil service and get some return on investment, than transfer that expense (plus much more) to pay for more welfare, unemployment, prison costs etc. The civil service however, must become more customer friendly and focused, it does not help when the people who are paying your wages, get less than helpful service. I applaud them for agreeing to take a 3.2% pay-cut, but 5% would have been more meaningful. In these extraordinarily difficult times, if we all shoulder a little of the weight, the challenge we face can be met. Following concerns from local sea captains that the mangroves had suddenly disappeared sometime over the weekend, revealing a cleared area of marl along the shore of the North Sound by the Dragon Bay site, Ryan confirmed to CNS that the clearance work had been done. He said it was part of a project to remove the old dead mangroves and rejuvenate the area. Acknowledging it was a sensitive issue, the Ritz Carlton developer said the removal was strictly within the limits granted by the Central Planning Authority. At the invitation of Ryan, CNS visited the site on Wednesday afternoon with Ken Crews, a land development expert from Orion Development, who pointed out what had been cleared and where the mangroves would be replanted to create this new 50 foot fringe. 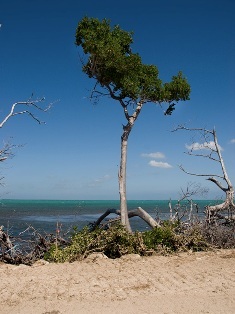 He stated that the original mangrove buffer of some 250 to 300 feet stretching along the coast for 1500 feet had been removed because some of it was dead and because of the potentially hazardous debris in the areas where the mangrove was still alive — all a legacy, he said, of Hurricane Ivan. He also noted that the plans included constructing a seawall to protect the wider property as it had been affected by storm surge during that hurricane. Although some of the mangrove buffer which has been removed was still recovering from the infamous Ivan surge, according to aerial photographs taken before the clearance some two thirds of the buffer zone which has now been torn up was full, healthy, mature mangrove. 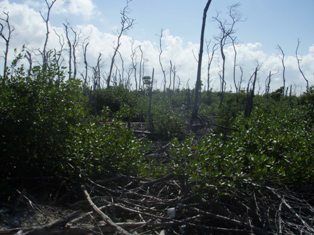 Experts from the Department of Environment, who had advised the CPA against allowing the removal of the mangrove buffer, said they had not seen evidence of hazardous waste in the existing healthy zone and the area being described as dead by the developer was in fact making a significant recovery (pictured left). There were also concerns that there had been previous encroachment by the Ritz development on the mangrove buffer in that area. 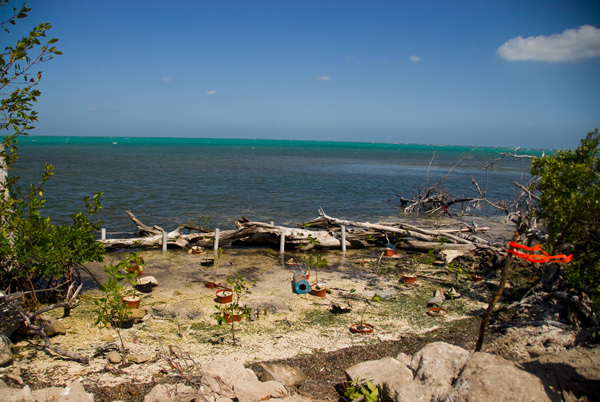 Director of the Environment Gina Ebanks- Petrie said that it was disappointing to see another mangrove buffer zone lost, given how much has already been removed from Grand Cayman’s coastlines. She said once mangrove was ripped out there were significant problems associated with trying to replant it. During the planning application process the DoE submitted comments to the CPA pointing out that it could not identify any exceptional circumstances in this case that would enable the authority to grant permissions under the law to remove the natural buffer. The department also noted that mature stands of mangroves had proven to be considerably more effective against storm surge than seawalls and they provide nursery habitat and other ecological functions that cannot be replicated by artificial structures." 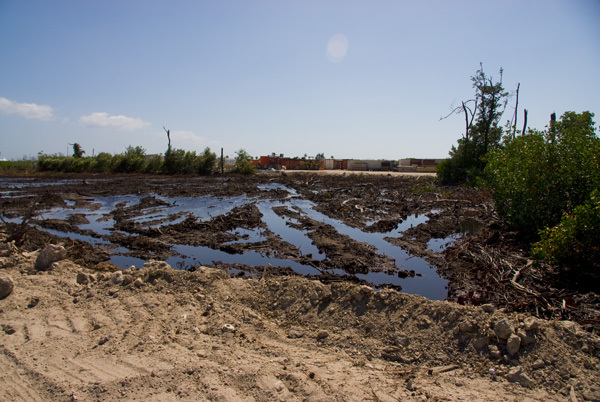 CNS has made several attempts to contact the chair of the CPA regarding the exceptional considerations that were made and that led to permission for the healthy as well as the dead mangrove buffer zone to be removed but has so far been unsuccessful. Dragon Bay is a planned multi-use development on leased crown land adjacent to port authority land on the North Sound coast behind the Ritz-Carlton hotel. Ryan has said he plans to make the North Sound the doorway to this new community. (CNS): According to documentation seen by CNS, the Central Tenders Committee has already assessed the schools construction management contract and cited Hensel Phelps, a US based firm, as the winning bid. The CTC has been considering a number of bids on the beleaguered school projects for several weeks after Tom Jones International walked off the job last year due to a dispute with government. Although not the cheapest, based on CTC’s points criteria, which looks at past experience, specialist expertise as well as cost, Hensel Phelps scored the most points at 84.20 with a bid of $6.5 million. Sources close to the issue said that Hensel Phelps appeared to have no visible Caymanian partners but have considerable experience building schools and colleges, as yet however, it appears no contract has been awarded. The bid was considerably lower than the one submitted by the consortium specially formed by a group of local contractors, which scored 78.43 points with its bid of over $8.5 million. Arch & Godfrey, McAlpine, Hadsphaltic and DECCO had created CCML as a joint venture for the sole purpose of submitting this single bid to provide services for the completion of the Clifton Hunter and John Gray High Schools. At the time of making the CCML bid Ian Pairaudeau, Managing Director of the McAlpine operation in Cayman, said the successful bidder would be inheriting the project at a critical stage, with an aggressive completion timeline and limited recruiting time. “The advantage of CCML is that it allows us to pool our locally based professional staff, keep the work in Cayman and avoid the costly time delays of having to recruit a large team from off island. It allows us to provide a more effective solution to the government and a single firm whose exclusive purpose and focus is the satisfactory completion of the schools projects,” he explained. Work at both the George Town and FrankSound sites ground to a halt last November after TJI entered into a public battle with government over payment for the project, which is now being dealt with by the courts. Hundreds of local workers were laid off as a result of the dispute and the school sites have been largely silent since. Sub contractors Caribbean Mechanical returned to the sites at the end of January in order to undertake maintenance work to prevent deterioration, but neither site has moved forward for some six months and few workers have been re-hired. The invitation to tender for the construction management contract was issued in February and closed in mid-March but no further announcements about the next step in getting the project back on track have been made. Education Minister Rolston Anglin said last month that he was still hopeful that the schools would be completed by June next year ready for the September 2011 school year. 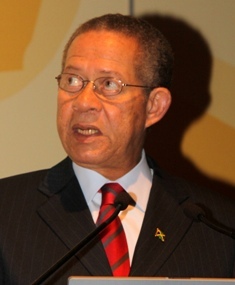 (BBC Caribbean): Pressure has been mounting on the Jamaican Prime Minister, Bruce Golding, to resign after his surprised admission on Tuesday that he authorised attempts by his Labour party to lobby the US government to drop its extradition request for a strongman in his constituency. The United States has been seeking to extradite Christopher "Dudus" Coke since August last year. Washington says he is wanted on drug trafficking and gun running charges.The Bruce Golding administration has been challenging the extradition on the grounds that the evidence against Mr Coke was unlawfully obtained. 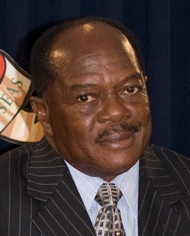 McField said that, despite the message that he will be delivering, the premier had still asked him to attend not just to say that Cayman did not have a mandate from the people to seek independence but to assess what was happening with other overseas territories regarding the issue of self governance. Charles Glidden, the premier’s press secretary, said the focus of the discussions at the seminar will be the steps and actions to be taken to advance and complete the process of decolonization of the non-self-governing territories. He said that the seminar is being held in New Caledonia from 18 to 20 May and the airline ticket was being issued by the United Nations, which will also “defray related expenses”. McField added that he was honoured to be attending on behalf of the premier and said it was his most important accomplishment to date, even surpassing his significant achievement of being called to the bar in London in 1977 following trials, tribulations and discrimination.